Readers of our blog might recall that Jan von Hein and I convened a conference on coherence in European private international law in Freiburg i.Br. (Germany) in October 2014 (see our previous post). Today, we are happy to report that the findings of the conference have just been published by the German publishing house Mohr Siebeck. The volume critically assesses the current state of European private international law including the law of international civil procedure. 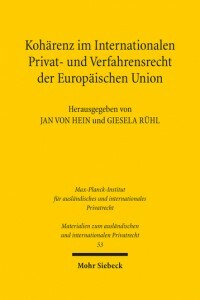 It sheds light on existing incoherences, describes the requirements for a more coherent regulation and discusses perspectives for a future European codification in the field of private international law. In addition, the volume contains English language summaries of each contribution as well as detailed discussion reports. Anatol Dutta, Gemeinsame oder getrennte Kodifikation von IPR und IZVR auf europäischer Ebene: Die bisherigen und geplanten Verordnungen im Familien- und Erbrecht als Vorbilder für andere Rechtsgebiete? Thomas Kadner Graziano, Gemeinsame oder getrennte Kodifikation von IPR und IZVR: Das schweizerische IPR-Gesetz als Modell für eine europäische Gesamtkodifikation – Lehren für die EU?